Harley Quinn, in Bombshells, is much the same as she is in the mainstream universe: sure, she may be British, but she's still a doctor, still fell in love with the Joker, and still went crazy. Of course, in this incarnation, "Mr. J" started out as a local gangster with Robin-Hoodish overtones, and Harley got skeeved out by him as he turned more and more violent (which seems like a meta-commentary on the fictional character's gradual shift from prankster to sociopath over time). But that yet again proves that Harleen's reverberating mytharc is one of escape from abuse, not victimization by it. This Harley seems to have powers, though. She breaks the fourth wall even harder than usual (she exists in a world in the middle of WWII, but she can make jokes about Christian Bale's Batman? ), and is still as acrobatic as ever, but there's more than that. As she said, "everything that comes near me turns into comedy gold." What does that mean? She's kind of like a living Looney Tune: in one instance, she got bonked on the head and started seeing little birds circling around her; normal enough for a comicbook, but then she sicced the imaginary birds on her enemy, who started getting pecked by them for real. Wha-huh? We told you last time that the Bombshells line began not as pure pin-ups, but as a mix between that style and rockabilly, with the look we know today coming together through several rounds of design. Harley Quinn is definitely one of the characters who benefitted the most from this change, because while Poison Ivy was pretty much the same from the start, Harl started out as about 100% rockabilly and 0% pin-up: she looked like a biker girl. There there was the Udon pass, which just made her look like modern Harley with kneesocks and chunky high heels. Finally things got to the point where we are now, which keeps her essential "Harleyness" intact, but makes it clear she's not simply today's Harley in a different jacket. The figure was sculpted by Paul Harding, who handled all four ladies in this first series. Her blonde hair is pulled up into two pigtails, mimicking her familiar jester cap, and she's got a pleasant smile on her face. her face is a bit thinner than usual, with a pointy chin, but maybe that's a result of poor nutrition while growing up in the interwar period? Mine has a small paint flaw, leaving a little spot of pink on the tip of her nose. That should be easy to touch up, though. 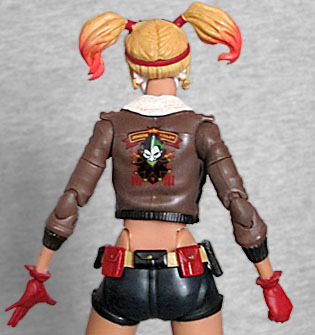 Harley is sort of dressed like an aviatior: while her costume consists of the typical red and black leggings, a red and black bra, and black booty shorts, she tops the ensemble off with a leather bomber jacket and a pair of goggles pushed up on her head. One of the near-final designs even had her wearing an aviator's cap, though that obviously lost out to the pigtails so she could more easily be recognized at a glance. She sports a utility belt that she seems to have stolen from Batman: the pockets on it are red and black but the belt itself is gold and has a bat symbol on the buckle. This is especially odd since the Bombshells world does not have a Batman. The back of her jacket has a painting of the Joker, and one of his playing cards is tucked into the band of her stocking. The figure can be displayed with your choice of six hands: two fists, two gripping, one splayed, and one flashing a peace sign. Her weapons include a pop gun (which again shows her breaking the fourth wall by somehow managing to have a little Batman charm hanging from it - an actual separate piece, no less!) 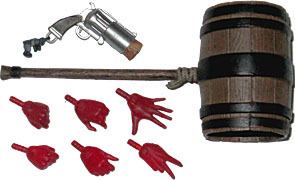 and a homemade mallet that's really just a barrel she tied a handle to. Comedy gold! 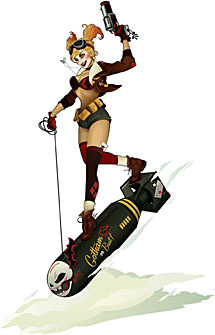 The artwork for Harley had her riding a bomb, because she's crazy. Apparently that was too difficult to pull off, so her statue just had her standing around. Thanks to the toy's plentiful articulation, you can do both. Or even more! Harl moves with swivel/hinge joints at the ankles, wrists and shoulders; double-hinged elbows and knees; swivel thighs and biceps; a hinged waist; and balljointed hips, chest and head. There's also an extra hinge in the hips, allowing them to drop down about ⅛" to help with those exaggerated pin-up poses. Bombshells Harley Quinn is not as big a departure from the norm as most of the other characters are, but she's still sassy fun.